Scott McKenna believes that Aberdeen have been on the end of rough justice at Hampden as a picture emerges of the damage done to Ryan Christie by Dom Ball. 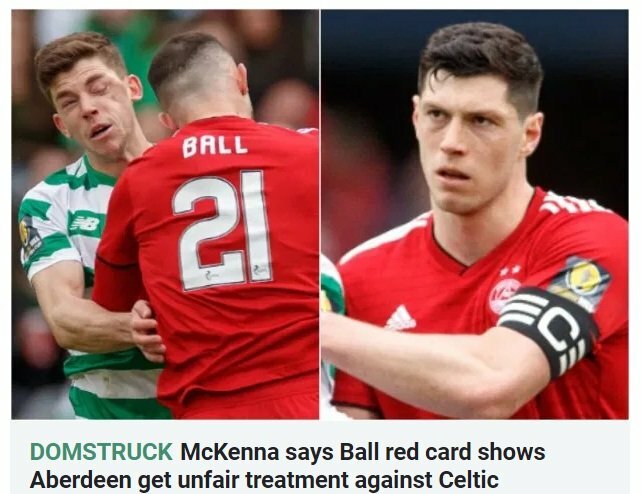 The Celtic midfielder required six minutes of treatment on the pitch with the yellow card issued to the defender resulting in him being ordered off. Christie was always going to win the header but with his eye on the ball he was flattened by the late arrival of Ball with the damage obvious from the picture above from The Sun. I’ve not had a chance to watch the incident back yet and I was a bit of a distance away but it was a sickening injury. You never want to see someone get an injury like that on the pitch. Earlier this season, Gary Mackay-Steven got knocked out after a head injury from Dedryck Boyata and there was no action given against Boyata. Christie gets his head knocked in this match and our player gets the booking. The way the two of them were handled, it could have been a bit different. Boyata stayed on the pitch, but we lost a man. Was Dom’s challenge reckless? It might have been. But was Boyata reckless when he knocked Gaz out? Who knows? It just seems unfair. There is no comparison between the two incidents other than they both involved head knocks. Ball ran towards Christie in yesterday’s incident, at Hampden in December both players were moving in the same direction towards the ball when Mackay-Steven crashed in to Boyata. Both players required lengthy treatment, Boyata returned to play on with his head bandaged while Mackay-Steven went to hospital for treatment. Referee Andy Dallas took no action.